As chipmakers realize the power and increasing amount of silicon is inside our connected devices they are racing to own as much of the market as possible while publicizing their work in the internet of things. Yesterday, for the first time, Intel broke out details regarding the revenue associated with the internet of things. It was up 32 percent year over year to $482 million, a veritable nanometer of Intel’s $12.8 billion in total revenue for the first quarter. But the fact that the world’s largest chipmaker decided to break out its IoT platforms and software products marks a trend in the chip world. But unfortunately for giants like Intel, which have focused on the high-end x86 chips in servers and personal computers, the internet of things might have a lot of promise but its average selling price for silicon is generally low. Also, it requires a very different mindset on how to build and market chips. Even ARM, which is currently king of the smartphone and tablet landscape with its high-end application processor architecture, sells the IP for its lower-end microcontroller cores found in many IoT products for less per license on average. Are chipmakers ready for this? So the question for chipmakers at the high end is whether or not they can make it in a market selling a high volume of chips with low-end pricing. Or whether they want to get into investments in software and services to offset the lower profits associated with the IoT silicon. Sensor hubs, microcontrollers and more! Meanwhile, for the companies that have been in the embedded markets for decades selling radios, sensors and microcontrollers that are smaller than 32-bit, the internet of things is a huge opportunity that’s right in their wheelhouse. I’ve covered this before, but focused mainly on microcontrollers and sensors. But thanks to the introduction of the iPhone 5s last year and its dedicated M7 motion sensing processor there’s a new opportunity that IHS iSuppli says will grow 154 percent from last year to the close of 2014. The analyst firm calls this market “sensor hubs,” and defines it as any processor that takes in and compute sensor data to avoid using a device’s application processor (if it’s a phone) or microcontroller if it’s a smaller device. It estimates that worldwide shipments of sensor hubs in 2014 will reach a projected 658.4 million units. From then until 2017, the market is pegged to increase 1,300 percent to shipments of 1.3 billion units (see chart below). The creation of a new processor type is worth noting, but it’s part of a an interesting trend that companies ranging from Atmel and Qualcomm to Freescale and Texas Instruments are specifically building around — a market that needs many modular, small and low-power products for everything from a connected fridge that runs on a home’s power to a microcontroller and radio tucked under the jewel of a ring. This isn’t a variation in performance that Intel is terribly familiar with; this a fundamentally mix-and-match mindset that optimizes not just around performance — or performance and power — but also around size, different types of sensors and even power management functions for specific battery types. Intel was late to the maker market with its Galileo boards, which launched last fall featuring a new, smaller Intel chip. That means others are racing far ahead getting their products into as many hands in many different formats as possible. There are countless people building on open source platforms using chips from Broadcom or Atmel to make variations on the Arduino or tiny Bluetooth radios designed for wearables or even whole new processor designs. 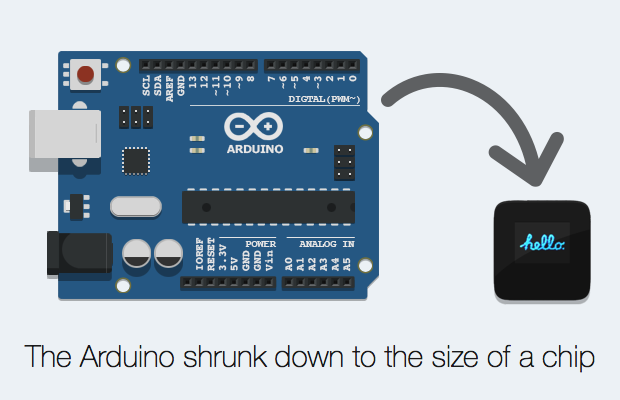 Check out the MicroView or the TinyDuino for examples of much-needed innovation on the basic computing offered by the Arduino. You don’t even have to be a totally open platform like the Arduino either. ARM is backing Sunrise Micro Devices in the hopes of making a radio module containing a microcontroller with a longer battery life because it sees a need for a higher-level package for makers and product designers experimenting with the internet of things. The idea is that one of these could be in the next Pebble watch or even in hundreds of devices as a basic component in certain types of clothing, much like those light up sensors are in kid’s shoes today. And it’s not just existing processors and chip vendors trying to offer the wider array of features and components in a variety of sizes and power budgets: there are whole new opportunities for processor designs. For example, the sensor hub concept is popular for accelerometers and gyroscopes, but one might eventually also add GPS into the mix, then offloading location. Smaller GPS chips such as the one announced Monday by CSR and OriginGPS. Outside of sensor hubs, a startup called Ineda has launched with $17 million in funding to build a microprocessor designed for wearables that boasts a 30-day battery life and is fundamentally different architecture than exists today. There is clearly opportunity for chip companies, but it’s one that requires a lot of flexibility and an ability to recognize a few lessons still being learned by enterprise CIOs. For starters, developers/makers are your customers and partners; open is better than closed; and hardware and software are both delivered as a service, so the real money is in services. The challenge will be figuring out how to serve those developers and building a business with margins more aligned to lower-priced devices and profits. Because there’s a heavy R&D investment chip firms have to make, balancing the protection of IP while also trying to embrace openness may offer some interesting business opportunities. In short, bringing everyday physical objects online is going to shake up the chip industry in a major way. So what’s happening in the Intel earnings isn’t as simple a story as Intel getting beat on mobile as mobile (and thus lower power) became more important, nor as nuanced as Intel’s data center story as end customers become both more demanding and more concentrated. Intel’s challenge in the internet of things will be directed at building an array of products with each optimized for different variables at price points that make sense for tiny devices. Or it will move into software and services associated with the enterprise and its premium chip products. This last strategy has so far been more successful. As a chipmaker Intel’s been engineered to produce a lot of one type of chip in great volumes better and more cheaply than anyone else. Its strength may also be its downfall as the market looks for greater variation and customization. But its CEO is clearly pondering the role its fabs play in Intel’s future as it seeks to manufacture chips for other customers. Given its decades of research into manufacturing, that’s a powerful asset Intel may yet use to ride the wave of connected devices at the hardware level. Agreed, and that’s why I doubt that the current Intel CEO, with his custodial mindset, can change the company’s culture to adapt to these market requirements. My point: we know that Intel previously applied their significant internal resources to address the mobile market opportunity, without success. Moreover, when you consider the results of the PC market miscalculation with their Ultrabook business strategy, I have to wonder if they’re in denial about the apparent shifts in the marketplace. I sense that it’s really difficult to transform business strategy at Intel. The big challenge with RFID was the price had to be “next to nothing”. One will need to approach IoT processor/MCU with a similar attitude in order to fulfill the promise of ubiquity. Stacey, your article makes one of the fundamental points for the semiconductor industry going forward – increasing die volume does not necessarily mean increasing profitability or even revenue for a wafer fab. We’ve seen this movie before in semis – smaller, less functional die require different manufacturing parametrics than billon-transistor processors for PCs and mobile phones. The RFID industry was going to redefine RF semiconductors with volumes in the bazillions. But fab economics run on wafers, not on number of tinier and tinier die. For me, IoT will do the same in the processor market – lots more die, but not so many more wafers. IoT will be an interesting market for new technologies like sensors, etc., but it will be incremental for the wafer industry. Check out mbed.org for a platform to develop IoT end points. lol everybody is crediting Apple for sensor hubs when they were way late, a bunch of high profile devices included sensor hubs before the Apple press decided to notice them. Anyway, what Intel includes now in IoT is not really IoT. This is not true at all really, Intel has a monopoly on x86 with a much smaller competitor , when they were not competitive they used illegal tricks (see the EU fine) and they have ridiculous margins. They don’t produce cheap,they sell at very high prices and is only getting worse in their PC business with smaller chips for higher prices. Intel doesn’t know how to compete , look at mobile ,this year they’ll bring in 1-1.2B revenue and have 5B op loses in mobile( a rough estimate).. If their overall margins erode they will panic too and outside their main line of products they’ve messed up a lot of times in the last few years.